Location: Crozant, in the Creuse departement of France (Limousin Region). Notes: Château de Crozant Crozant is located in the department of Creuse and Aquitaine-Limousin-Poitou-Charentes region. 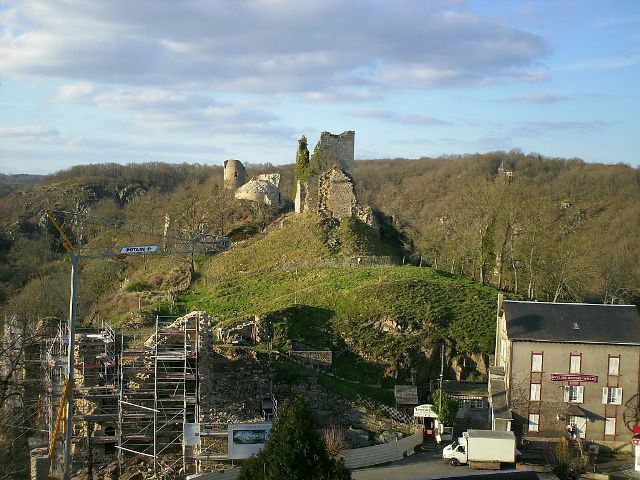 The castle is classified historic monument since October 3, 1997.The rocky outcrop between the Creuse and entered a tributary, the Sédelle, has been occupied since prehistoric times. It is the oldest Neolithic site of the Limousin.A fortress seems to have been originally built between 997 and 1018. The castle is however mentioned for the first time in a charter of 1200 to 1210 years.One of the remaining towers named Isabella of Angouleme, widow of John Lackland, wife of Hugues de Lusignan Earl of March, who according to tradition, would have built. In the twelfth century, the captains of the place are members of the Eddy Family of Saint-Germain-Beaupré. But this is the thirteenth century the castle takes the form we know today. These are the Counts of Marche who build fortifications in the thirteenth century and the middle of the fifteenth century.During the ride the Black Prince in 1356 during the Hundred Years War, the castle keeps out Anglo-Gascons who will eventually go their way on August 22, but not without having ransacked the village.After long negotiations the ruins were acquired several years ago by the municipality. A major rehabilitation program was undertaken with funding from the State, the Regional Council, the General Council and the town to the site reopens to the public after the travaux.Les remains of the castle and the ground plots were classified historic monument by decree of 3 October 1997.The ruins of the citadel cover much of the spur: several successive speakers, a square tower of the fifteenth century and two towers thirteenth century, plus a chapel and the "water tower" that allowed to go fetch water from the river while remaining covered.